Well the rainy season has definitely come to this part of Africa. It has rained almost every night for the last two weeks and a few days it has rained most of the day. There are puddles everywhere that you have to cross as you drive around the roads. I probably should say small lakes, as puddles probably is not an accurate description. When you start through, you never know how deep you are going in before you come out on the other side. A few times, water has splashed up over the hood but we have yet to stall in the middle. Hope our luck holds. For the most part the rain is welcome. Things get pretty dry during the dry season as they do at home in Utah. It does bring a few problems, however. The typical African home for the common people is a concrete room or if you are more affluent, perhaps two or three rooms, in a row of homes behind a concrete fence that separates the homes from the street. Generally, there is a metal door of some kind opening through the fence into the yard of the homes. Typically, there is a small wall you have to step over as you pass through the gate to keep the things that belong in the street where they belong. This includes the water. Unfortunately, a wall that will keep the water out will also keep the water in, so when it rains as it has the last while, many of the homes flood and the people find themselves living in water. In Africa, life is not easy. 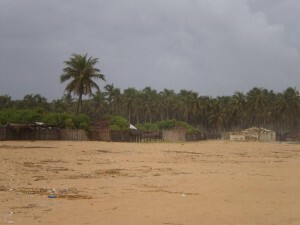 We returned from Togo on Tuesday and decided to be little adventurous and see if a small road that followed the ocean by Ouidah actually went all the way to Cotonou. 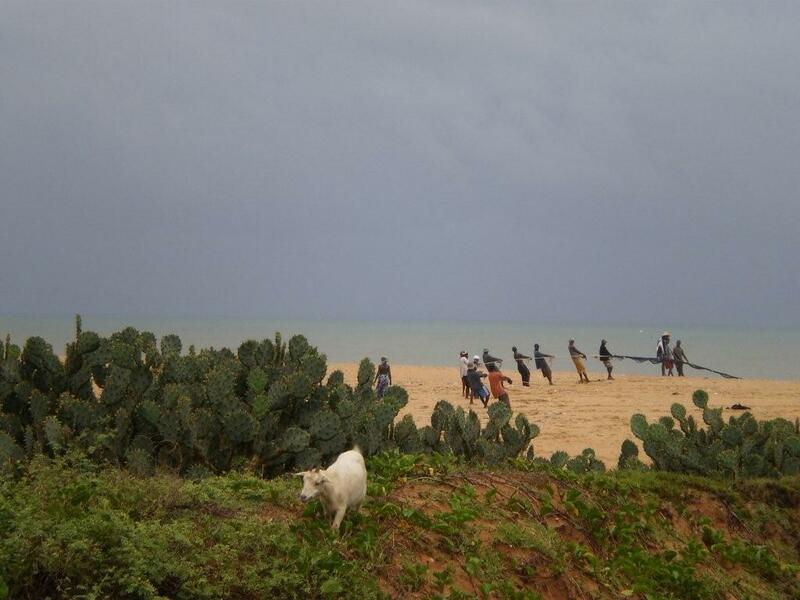 We thought that the worst thing that could happen was to have to turn around and go back to Ouidah. 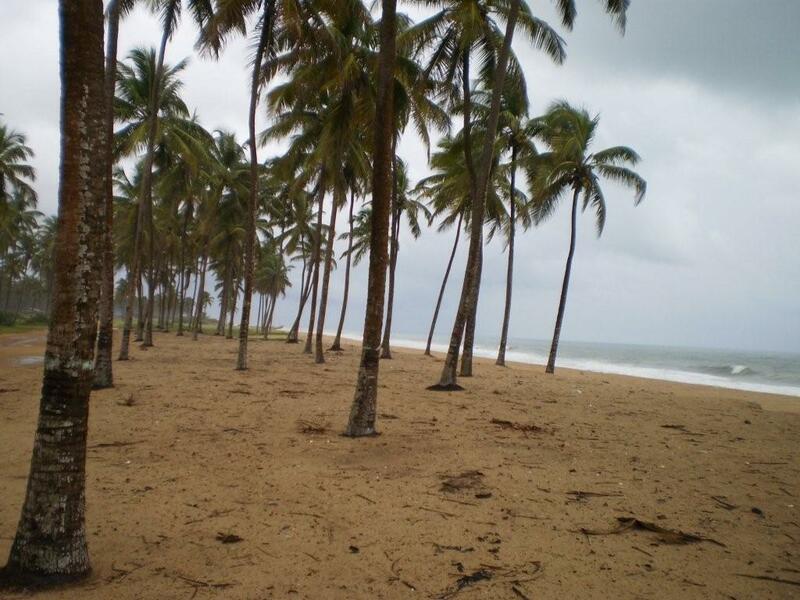 The main road between Cotonou and Lome is getting to be very repetitious so this new found road was a welcome change to our routine. What we discovered was small village after small village along the coastline in almost pristine settings. Imagine, if you will, tall palm trees with the constant splashing of the ocean’s waves in the background, fishermen pulling in their nets of fish and small thatched roofed homes clustered together in little villages and a few people walking along the road. There were some huts that had smoke coming out the roof and we finally determined that is where they smoked the fish. There are many smoked fish for sale in Cotonou and we finally discovered where they came from. 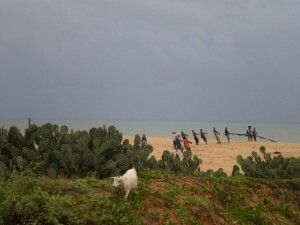 It made us feel like we entered another world far from the bustle of the city life in Cotonou and Lome. It definitely buoyed our spirits. 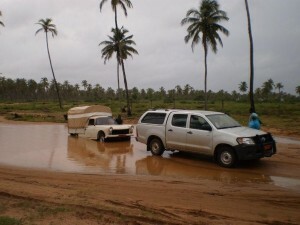 After going for a few miles we came across a Peugeot pickup that was stranded in one of the lakes of water. There were several men there trying to figure out how they were going to get it out, so we stopped to offer assistance. It did not take them long to come up with a skinny little rope for us to use to pull them out. I would not have guessed that it was at all possible to get the job done with that rope but they doubled it and told Elder Black to go forward but sure enough, it broke. So it was time for plan B. They decided that they would retie the rope and then help the pickup along but giving it a little “push power.” Plan B was a success and the pickup came out. Those little Peugot pickups are low to the ground and Elder Black said that they must have splashed water in the electrical system when they tried to forge the pool. All is well that ends well! 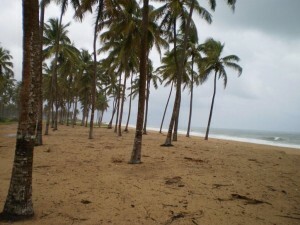 All the rain the last while has made the grass glisten, the palm trees and other vegetation were especially beautiful. Even the cacti looked greener and prettier. (I still can’t get used to seeing cacti in the tropics or having the ocean facing south.) People were friendly and we received waves all along the way. The little kids were especially interested in seeing real live yovos! The quaintness of the villages really conceals the poverty of the people. Any time we stopped or even just driving by, donations were always requested. I guess the people generally survive on fish, coconut and probably a little rice. 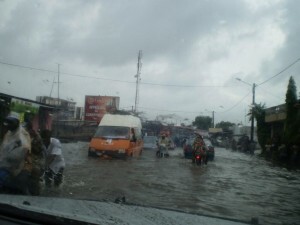 When the rains come there is an area by the beach called Fifadgi where the road is almost impassable because of the huge pond in the road. There is nowhere for water to go but to collect in the biggest low spot in the area which happens to be the road. When we reached it, there were motos stopped everywhere as their engines stalled after trying to forge the water. We made it through okay in our pickup but I will have to admit I was a little worried. On Thursday morning we went over to the Menontin chapel to measure a window and found President Lokossou and his son Jacques cleaning. They were listening to the Hymns on a CD player. I truly felt that we were entering the house of the Lord. We then told them that we were able to get the Primary Hymns in French. We told President Lokossou about them and he kept asking, “En Francais?” Yes, we assured him that they were indeed in French so Elder Black went out in the pickup and brought ours in for a demonstration. We put in the first CD and it began with “Je suis enfant de Dieu” or “I am a child of God.” President Lokossou and Jacques were so thrilled and big smiles came from both of them and then they started to sing along. It was beautiful. President Lokossou changed to a high falsetto with perfect pitch to match the young children’s voices on the CD. 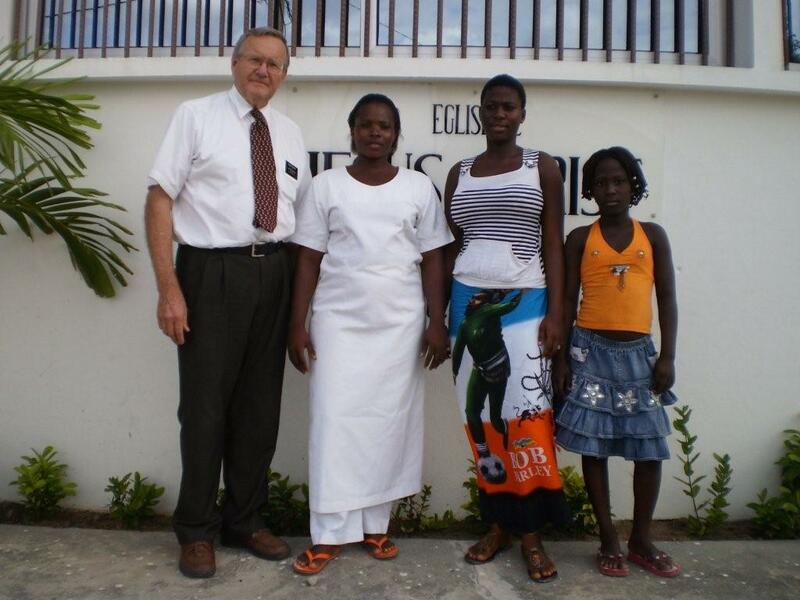 There were just the four of us in that small room and as I listened the Holy Ghost bore witness to me that we were doing what the Lord wants us to do–to help the members and the church get established here in Cotonou. That was truly a spiritual experience. The members here in Africa are so grateful for the small little things that we take for granted at home. Imagine that much excitement over a CD. I, Soeur Black, came down with an African bug on Thursday and was out of commission for about four days. I missed church yesterday but am up going today even if it is at a slow pace. I missed the baptism of a girl by the name of Elise on Saturday. 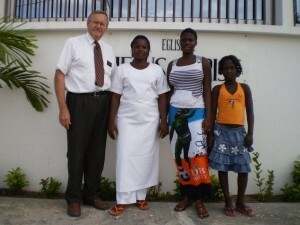 We have known her for about seven or eight months and were thrilled when she chose to be baptized.